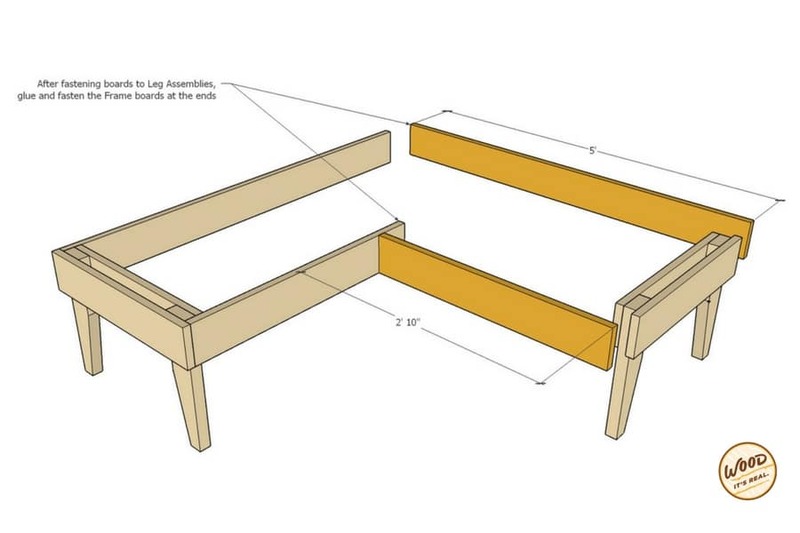 Build It: A Lovely Loveseat | Wood. It's Real. | Wood. It's Real. 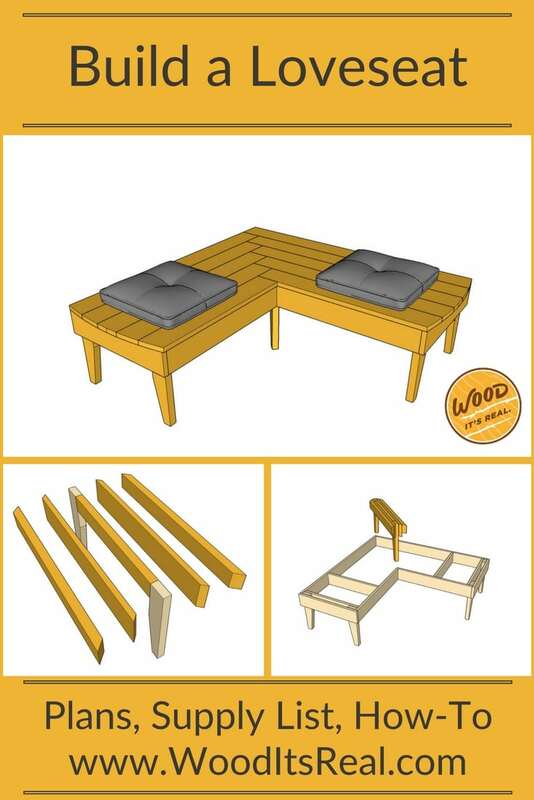 For Valentine’s Day, we came up with a weekend project built with decking boards and 2×4’s: a Love Seat. Get it? It’s a great bench style for instigating communication because folks are led to face each other in a more intimate way. This sort of coercion made us think about how Valentine’s Day reminds us to take a moment and pay attention to our loved ones, or our first dates, or whatever. 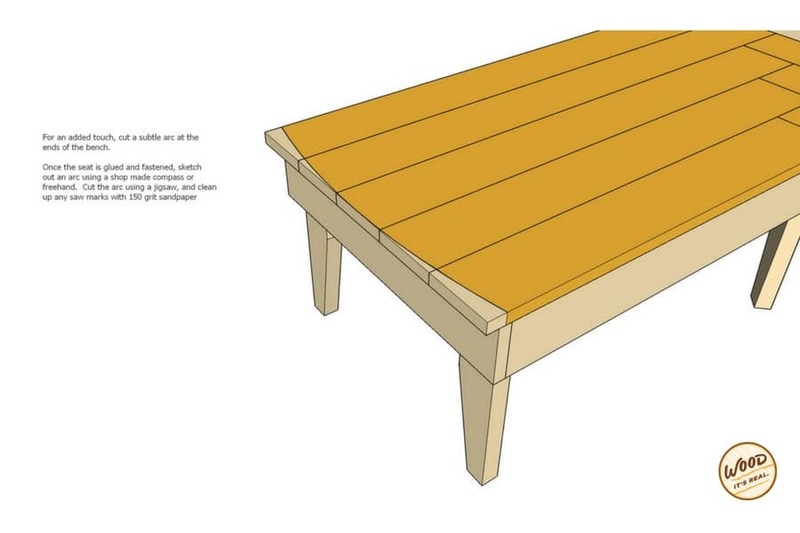 It’s a simple project and you don’t need to be a master woodworker to build it. 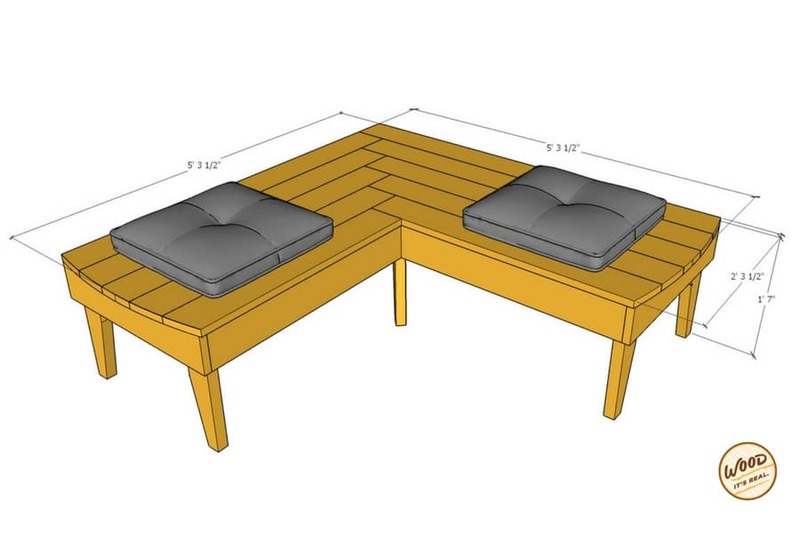 The loveseat bench only has a couple of miter cuts, and the rest is right angles.Lastly, the herringbone pattern on the seat is super easy to layout, and it kind of reminded us of hand-holding, another Valentine’s Day nod. You could also call this project a “First Date Bench or a “Conversation Bench.” We modernized the legs a bit and threw a subtle arc on the sides to soften it all up. 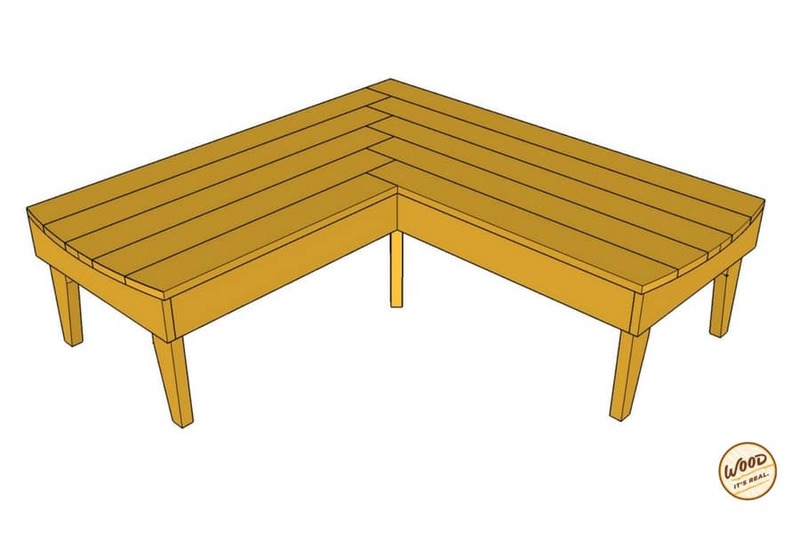 And now, for the fun part: putting your garden bench together. 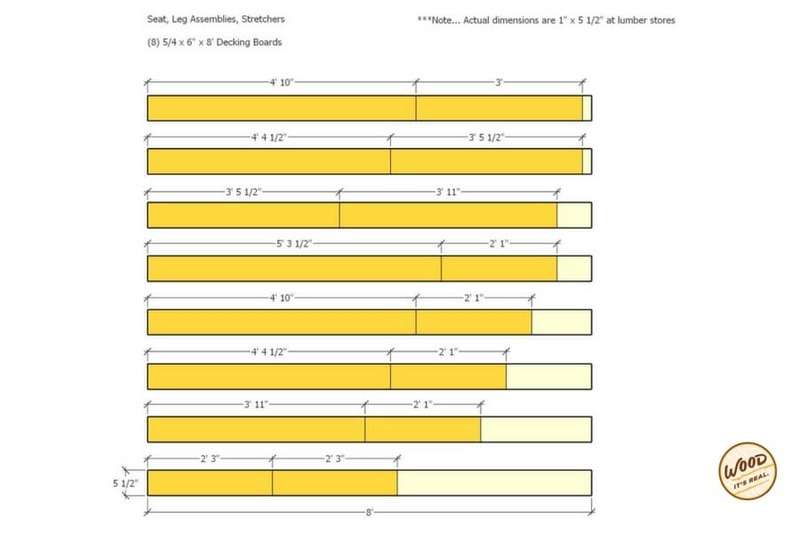 Grab your 2×4’s and measure/cut six pieces to lengths of 18″. 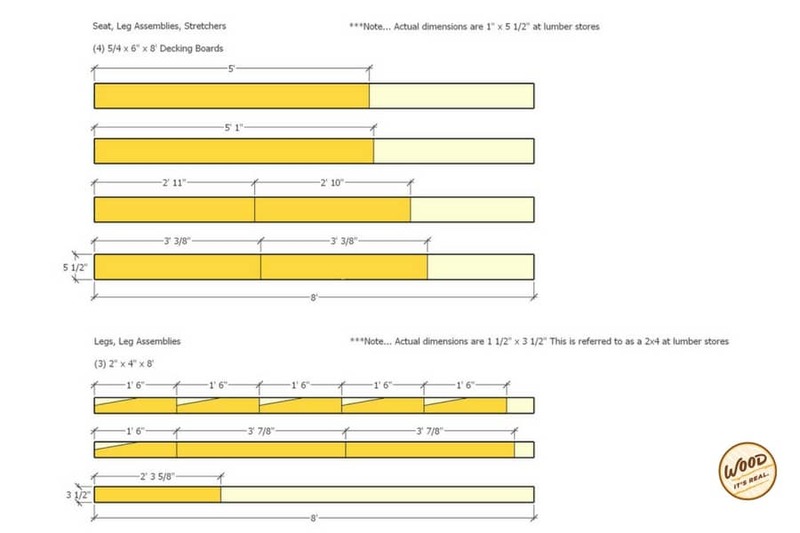 Measure 1.75″ from the corner of one board and make a mark. Then measure 10″ up from the opposite corner of the board and make a mark. 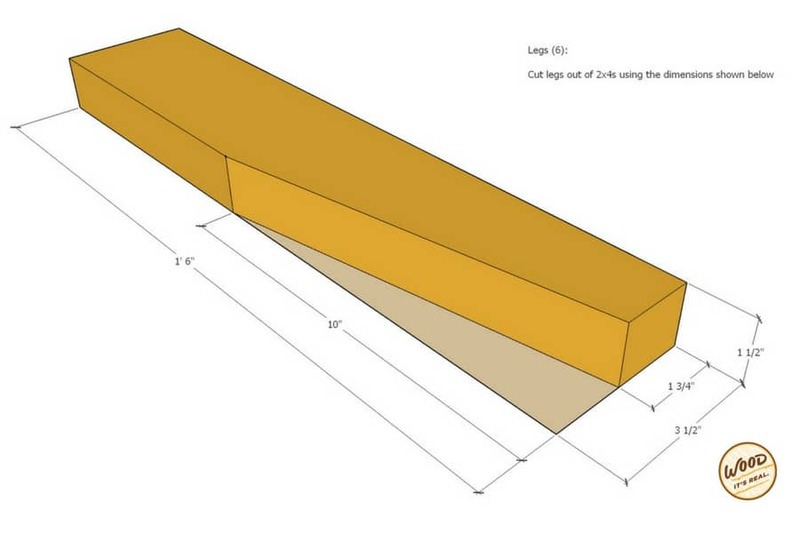 Use a straight edge to draw an angled line between the two marks. 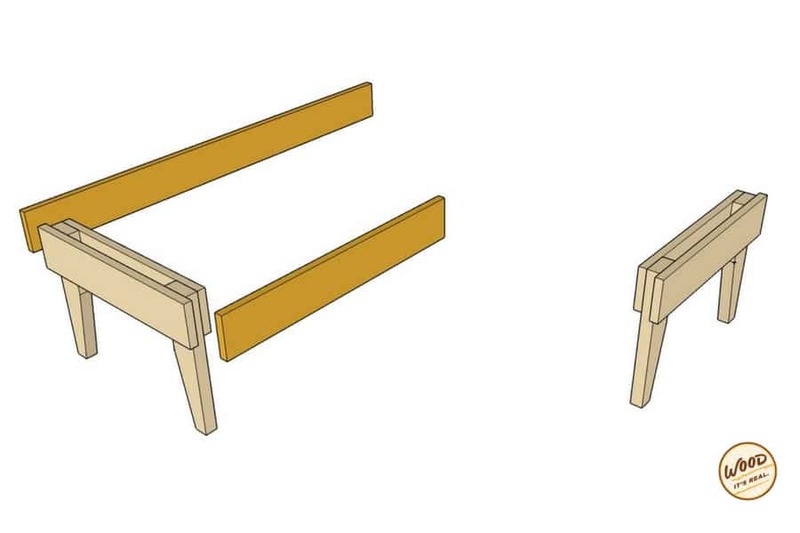 Cut the angle and you now have an angled seat leg. Repeat for the remaining 5 legs. Or you could use one leg as a template for the others. Cut two 2’3″ lengths and two 2’1″ lengths. 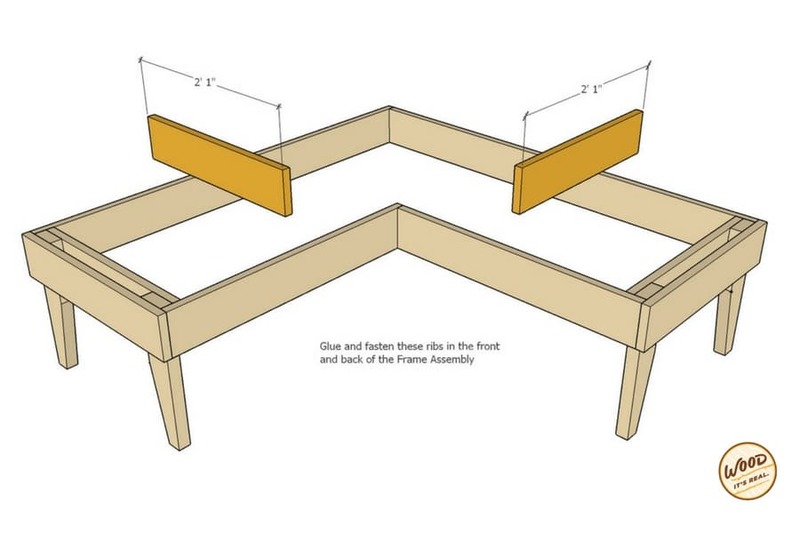 Make sure the longer board overhangs 1″ on each side. 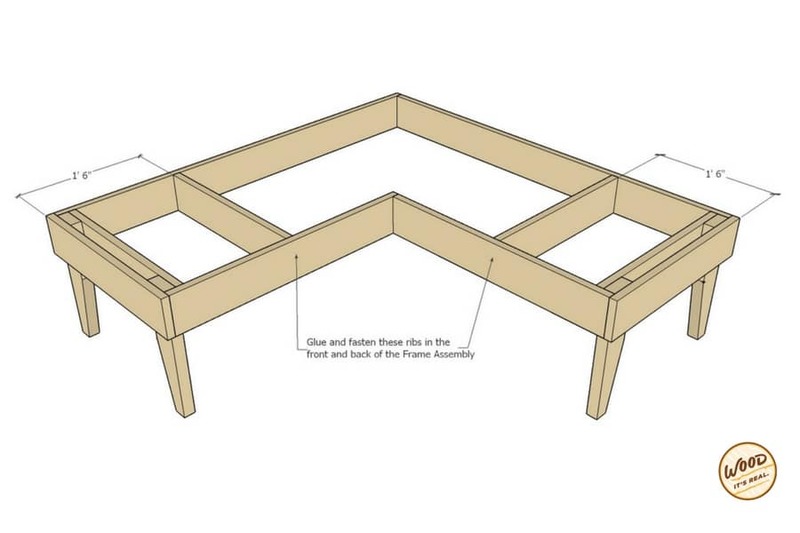 Once boards are in place, screw the assemblies together from both the inside and outside of the assembly to make sure it’s sturdy. Cut a 5’1″ length and a 2’11” length. Glue and screw the boards to the leg assembly. 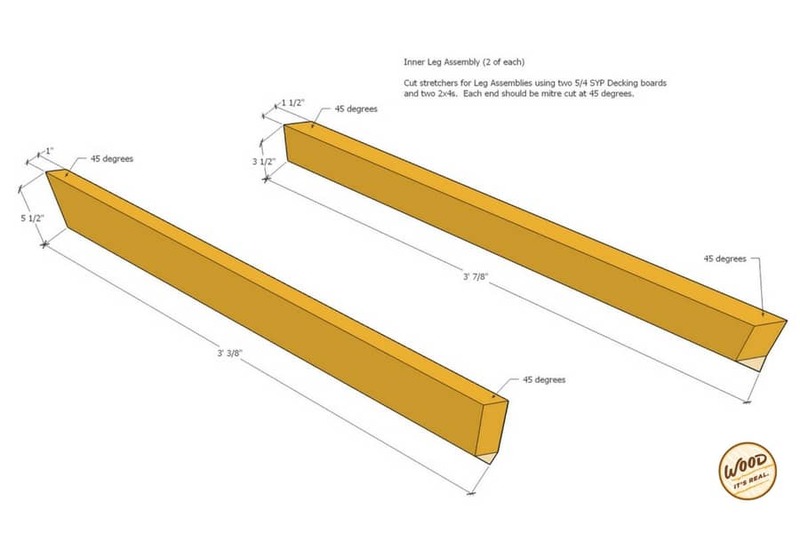 The boards will fit right inside the 1″ overhang of the leg assembly. 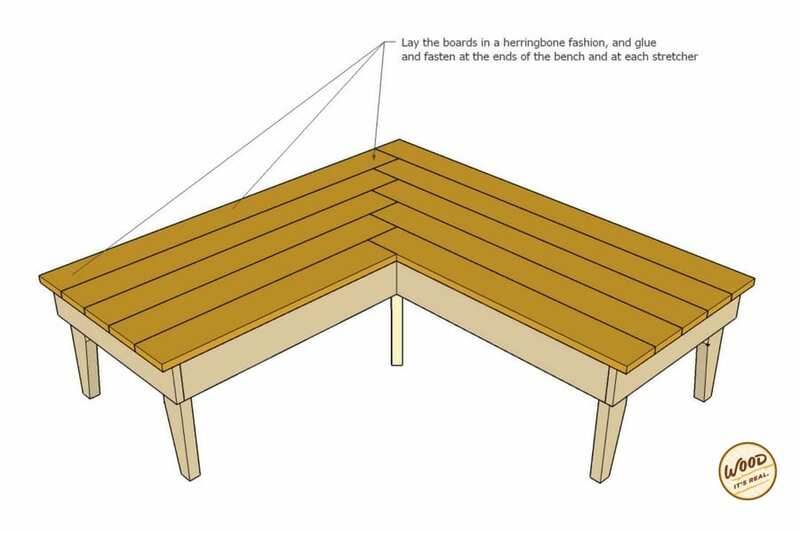 Cut a 2’10” length and a 5′ length from your decking board. Glue and screw these pieces to the left leg assembly. 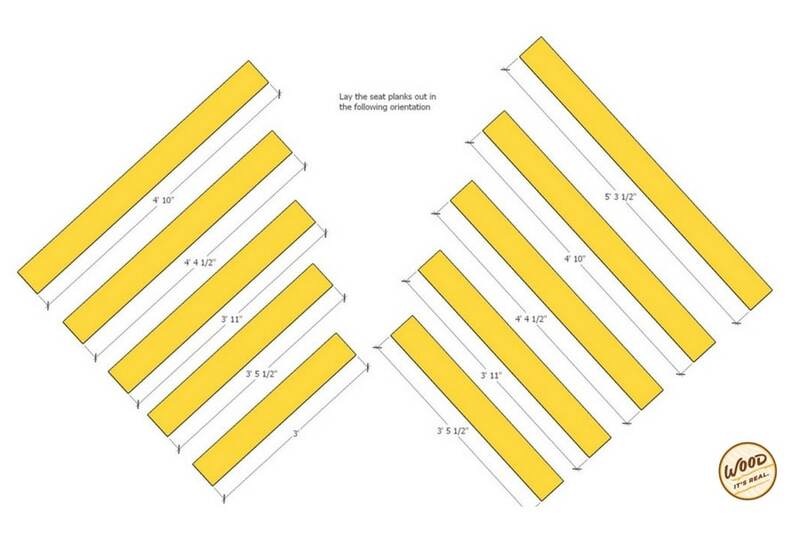 Cut two 2’1″ pieces of decking board. Measure 1’6″ from the exterior edge of the frame and make a mark. Glue and screw the ribs in the front and back of the frame assembly. 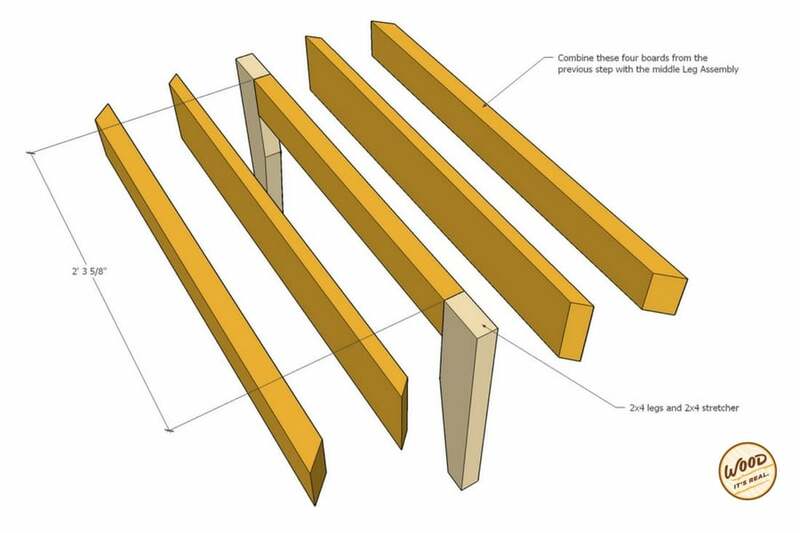 Cut two lengths of 3′ 3/8″ from your decking board. 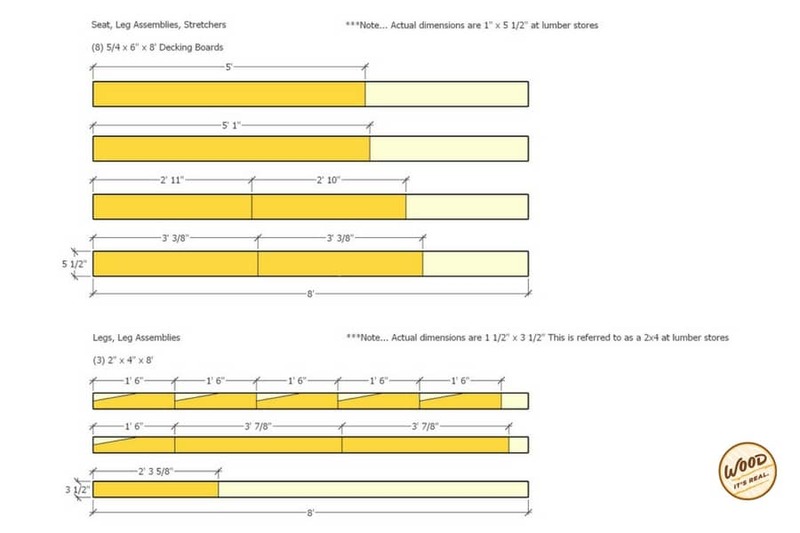 Cut two lengths of 3′ 7’8″ from your 2×4. 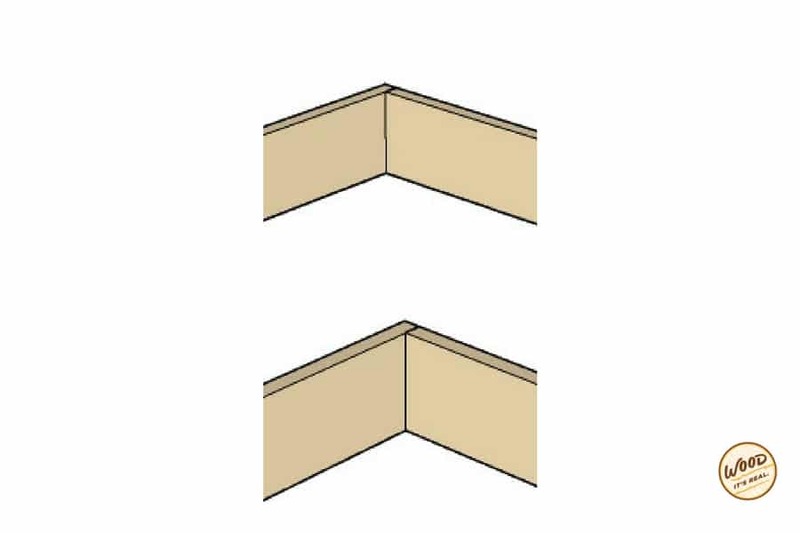 Using a miter saw or your handsaw with a miter box, cut 45-degree angles into both ends of all pieces as illustrated above. 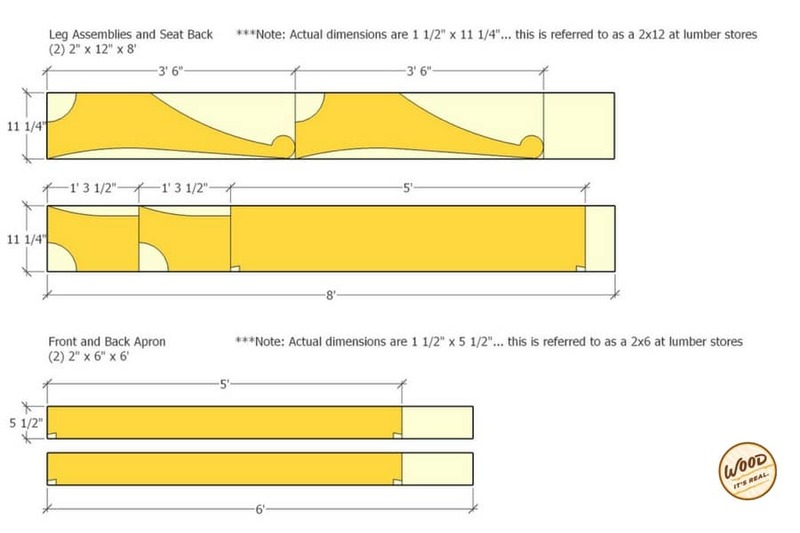 Cut a 2′ 3 5/8″ length from a 2×4. 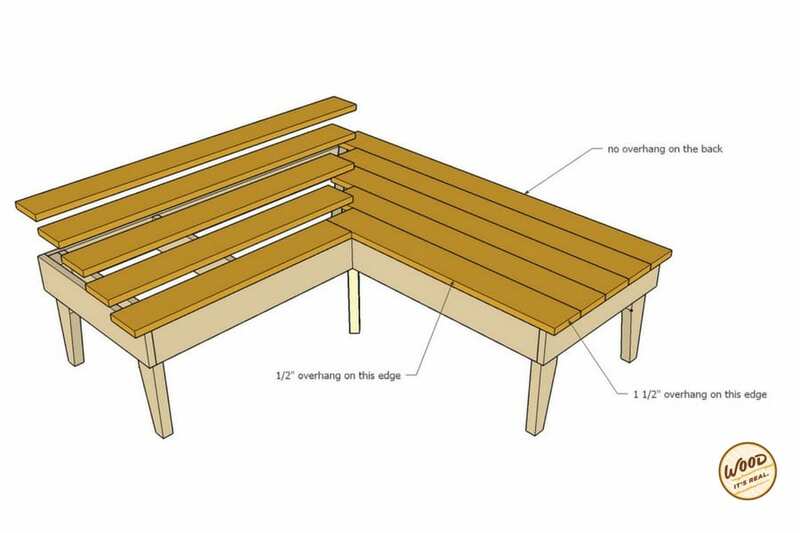 Attach all of the boards together using your longest 3″-3 1/2″ decking screws. 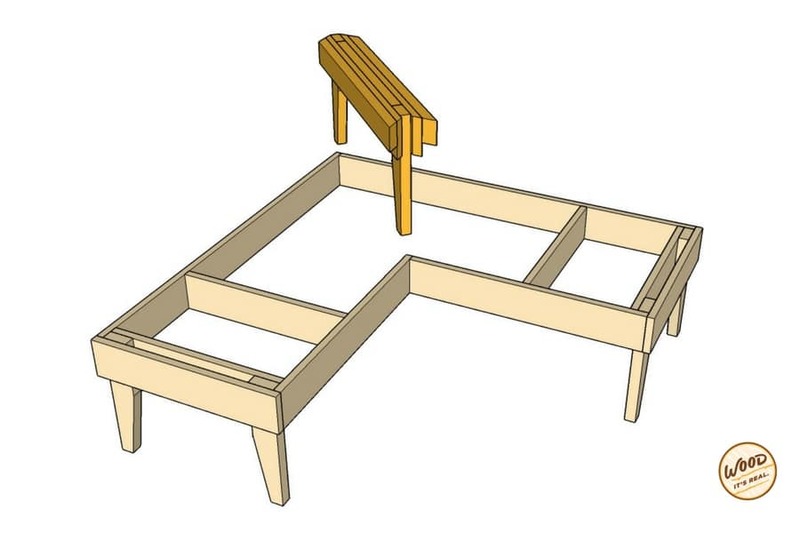 Insert the interior leg assembly into the corner of the frame. 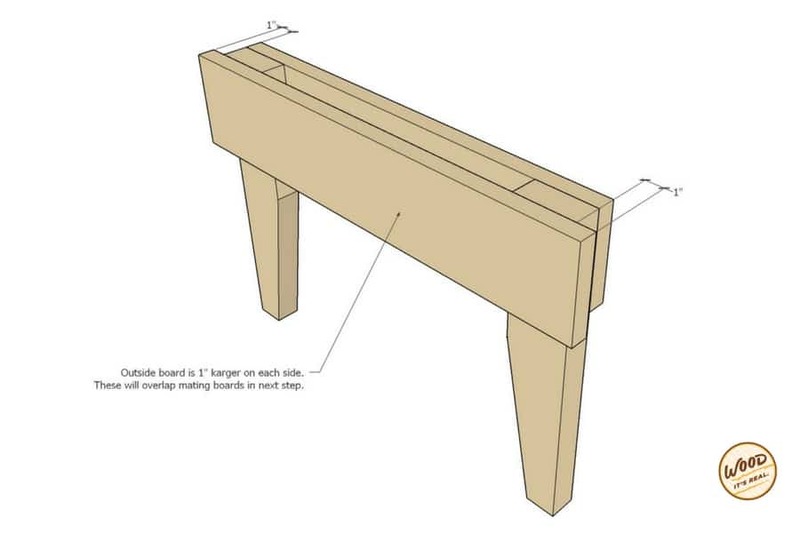 Wood glue and attach the interior leg assembly into the frame. Glue and attach the seat boards. 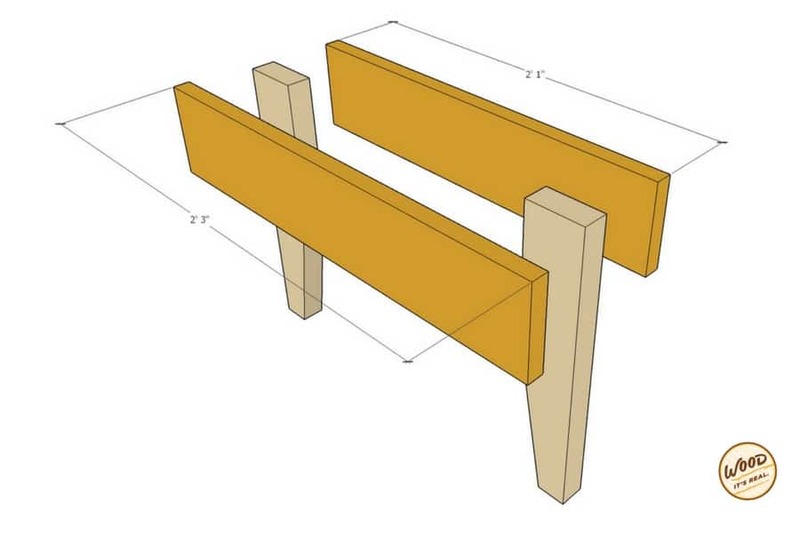 You will have a 1.5″ overhang on the ends and a 1/2″ overhang on the front. There will be no overhang on the back. 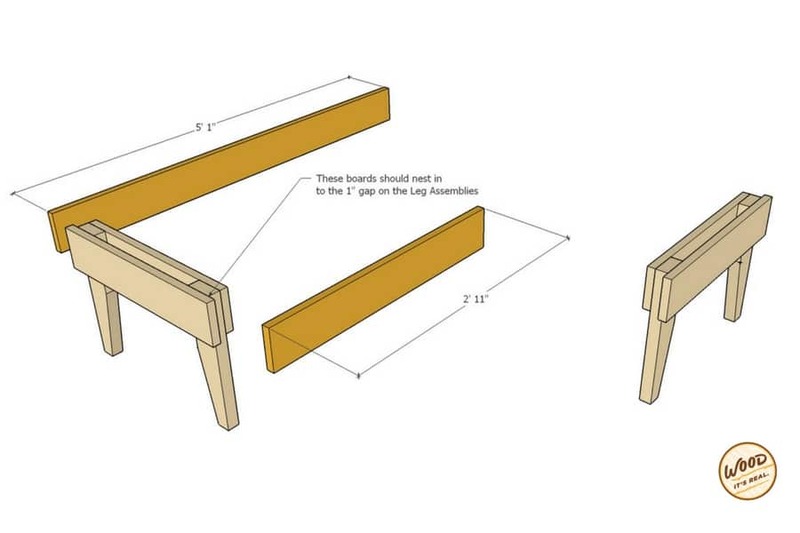 Once the seat boards are glued and fastened, sketch out an arc using a large compass or just freehand. Cut the arc using a jigsaw. Clean up any marks or rough edges with 150 grit sandpaper. 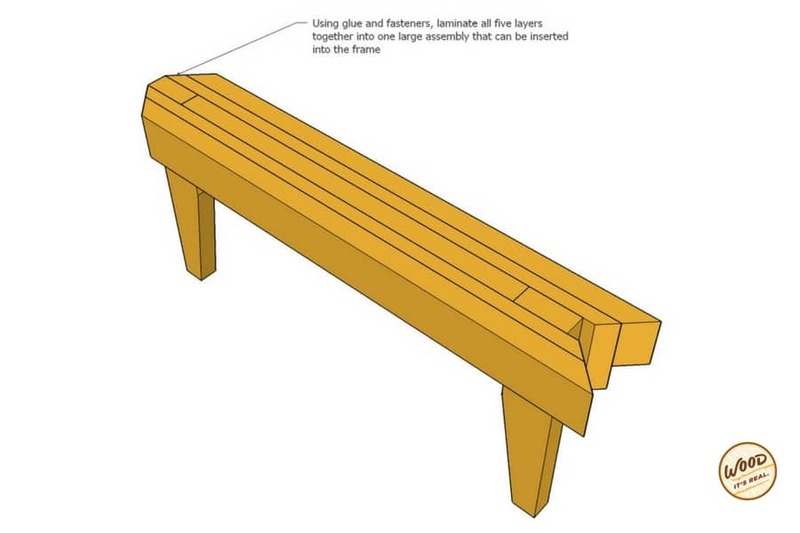 Give the bench a good sanding to clean up any rough edges. Grab a friend or your honey and love your new loveseat. How did it go? We love pictures and questions, please send both our way.